The greater Bir area is a constellation of smaller villages at the western edge of the Kangra District of Himachal Pradesh. For the first-time visitor, the question of which part of this area is actually ‘Bir’ can be a bit confusing, since different populations use the name to refer to slightly different areas. 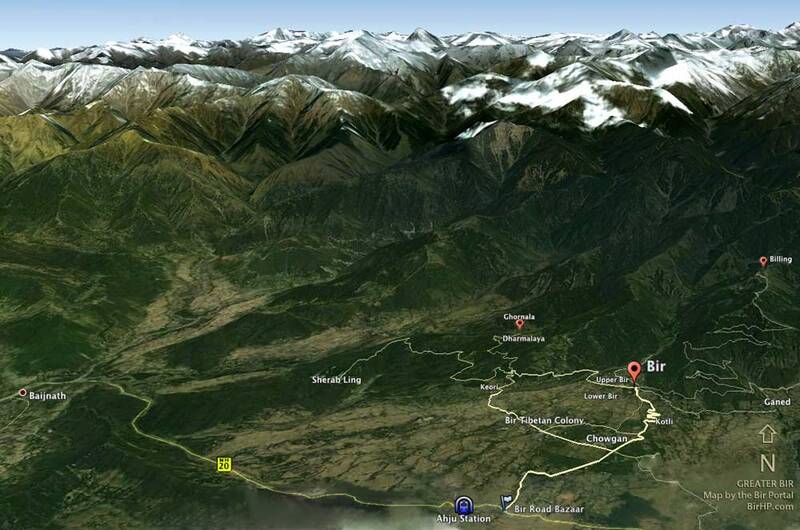 The virtual tour below (courtesy of Dharmalaya), will help you get your bearings. There are several neighbouring villages that are often referred to collectively as ‘Bir’ (especially by people who aren’t from the Bir area, but by some locals as well), including Bir proper, Chowgan (home of the Bir Tibetan Colony), ‘Bir Road’ market, and as well as the surrounding villages of Billing, Bhattu (Sherab Ling), Keori, Gunher, and a few other hamlets. 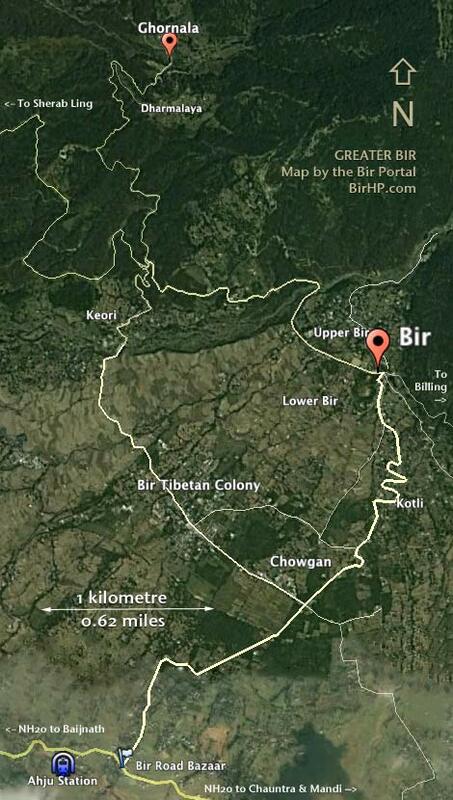 For clarity, we will refer to the larger area as ‘the Bir area’ or ‘greater Bir’ and to the village of Bir itself as ‘Bir proper’. The original settlement of Bir (established circa 1600 C.E.) sits at the northern edge of the constellation of villages forming the greater Bir area (in what is now called ‘Upper Bir’), perched at the top of the gentle slopes of the Himalayan foothills, just before the earth turns sharply up toward the snow peaks. It is a quiet Indian village with most of its buildings clustered along the main Bir-Billing road. The heart of Bir proper is the Bir bazaar, a quiet market with only a few dozen shops. At the south end of Bir bazar is the bus stand and a large tea processing factory, which offers tours for those interested in a fine orthodox cuppa. Chowgan village is essentially a sprawling ‘suburb’ to the south of Lower Bir. It was settled more recently than Bir proper and has a different flavour. Most of its residents were farmers or government employees until the current generation of young adults got other ideas. It’s best-known feature is the Tibetan Colony (below), but the rest of Chowgan village is quieter, cleaner, and well worth exploring on foot on bicycle. Bir is also the staging ground for what is regarded as the world’s second best paragliding launch site: the tiny hamlet of Billing, just a few kilometers above Bir. Hundreds of pilots from across the globe come to Bir every spring and autumn to paraglide over the mountains and tea plantations of Bir and the Dhauladhar Range of the Himalayas. Lessons and tandem flights are available for beginners (but be warned that paragliding is a sport with inherent risks: injuries are not uncommon and there have been a few deaths over the years). Just a few kilometers west of Bir is Upper Bhattu, more widely known by the name of its landmark, Sherab Ling, a sprawling Tibetan Buddhist monastery and retreat complex. Sherab Ling serves as the exile seat of the 12th Chamgon Kenting Tai Situpa, one of the regents of the Karmapa and the Karma Kagyü lineage of Tibetan Buddhism. Sherab Ling periodically hosts courses in Buddhist meditation and philosophy. Accommodation is available at the Sherab Ling Guest House except at peak times (when you can easily stay in the Tibetan Colony; it’s a lovely one-hour walk, a reasonably level bike ride or a quick taxi hop).